Pundits have been crediting the recent Apple stock price gains to the Samsung Galaxy Note 7 disaster, but they have made the mistake of drawing an obvious conclusion that's actually only part of the story. 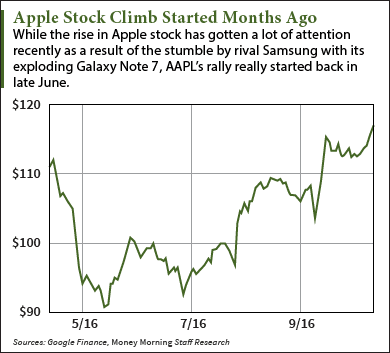 To be sure, Samsung Electronics Co. Ltd.'s (OTCMKTS: SSNLF) headaches of the past six weeks have given Apple Inc. (Nasdaq: AAPL) stock a boost. To catch you up: Samsung was forced to suspend sales of its flagship Galaxy Note 7 on Aug. 31, less than two weeks after the smartphone went on sale, following reports of exploding devices. Attempts to fix the problem failed, forcing Samsung to pull the Galaxy Note 7 entirely on Oct. 11. The entire saga was seen as a positive for Apple stock, which began selling its own new flagship, the iPhone 7, on Sept. 16. CFRA analyst Angelo Zino said he expects the Samsung disaster to boost iPhone sales by more than 14 million units in the September quarter. And the AAPL stock price most definitely has jumped up as the Samsung saga has played out. Apple stock is up nearly 11% since Aug. 31 and is trading at a 10-month high. But the Samsung news wasn't happening in a vacuum. Several U.S. carriers reported very strong pre-sales in the days after the iPhone 7's Sept. 8 unveiling, with T-Mobile US Inc. (Nasdaq: TMUS) and Sprint Corp. (NYSE: S) reporting year-over-year increases of about 400%. That also helped propel the Apple stock price last month. But many seem to have forgotten that the Apple stock price already had strong upward momentum going back to the end of June. Since June 27, AAPL stock is up 22.7%. Instead of harping on slowing iPhones sales as they had for most of the year, more analysts started to notice Apple's growing revenue from services. In Apple's Q3 earnings, services revenue was up 19% year over year, building on a trend that started last year. The services segment – things like the App Store, Apple Pay, and Apple Music – is now Apple's second-largest source of revenue behind the iPhone. The category accounted for 14.11% of Apple's total sales in the June quarter. Apple CEO Tim Cook told CNBC in July that he expects Apple's services revenue to reach "the size of a Fortune 100 company by next year." Growth in services shows Apple is getting better at monetizing its base of customers in a more consistent way, rather than depending almost entirely on hardware upgrades every few years. It's also a source of growth that doesn't require a new blockbuster hardware category. And better still, some of Apple's services have gross margins even higher than that of the iPhone's impressive 45% or so. Piper Jaffray analyst Gene Munster estimates the gross margins on AppleCare are about 70% and on App Store sales north of 90%. Credit Suisse has forecast that income from Apple services will double in less than four years. This promising trend is the main reason the Apple stock price is up so steeply over the past three months. 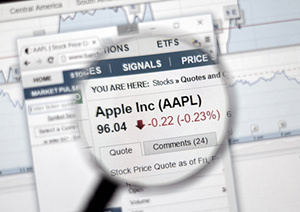 In the short term, AAPL stock could get another boost on Oct. 25, when the company will report its fiscal Q4 earnings. Early indications of sales for the iPhone 7 suggest it is doing better than expected. It's another case of analysts failing to see the obvious. What the iPhone 7 lacks in jaw-dropping new features it makes up for in upgrades that the majority of customers really want. Meanwhile, Apple investors shouldn't get too excited about the Samsung Galaxy Note 7 miscue. Whatever benefit Apple gets will be short-lived, as Samsung has another top-tier phone, the Galaxy S8, set for release early next year. Would like to see focus for retirees attempting to improve yields.